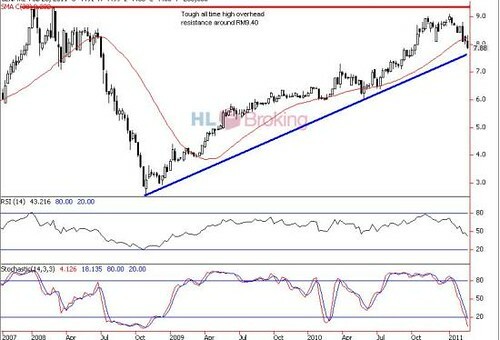 Genting Plantation – Crucial Up-Trend-LIne (UTL) support around RM7.50. Following a bullish breakthrough from the RM7.00 psychological barrier in August 10, Genting Plantation rallied to the double tops of RM9.00 (9 Nov 10) and RM9.09 (5 Jan 11) points. However, it tumbled to RM7.88 yesterday. 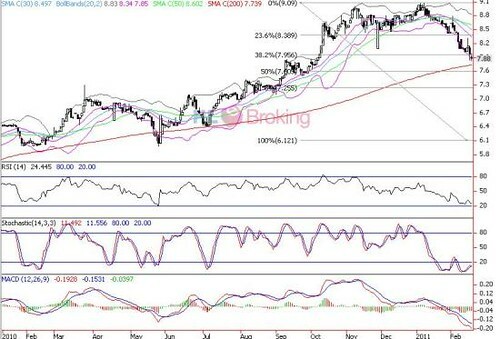 There could be more consolidations ahead as trend and momentum indicators are still showing no signs of strong divergence despite grossly oversold positions. Immediate support is at RM7.73 (200-d SMA), followed by RM7.60 (50% FR) and the critical long term Up Trend Line (UTL) of RM7.50. A break below RM7.50 will damage current uptrend and will push price to lower support zones of RM7.00-7.25. Immediate resistance levels are RM7.96 (38.2% FR), RM8.00 psychological level and RM8.11 (10-d SMA). Should share price swing above RM8.11, the next resistance targets are RMRM8.34 (mid Bollinger Band) and RM8.50 (30-d SMA).